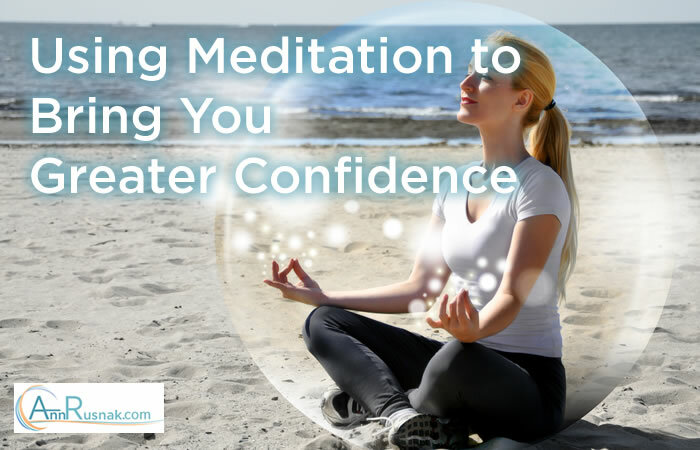 Many might find it shocking that meditation can be used to boost confidence. The truth is that meditation can be used to strengthen any emotion or skill. When you meditate, you bring a great amount of awareness into your mind. In the moment of meditation you hold the power to decide exactly what your life is all about. The past and the future melt away, and all that’s left is you. So when you actively decide to boost confidence, you will! Let’s say that you now have to lead a group of people at work. You’re feeling a little scared about it because all of the details are not falling into place as you’d like. Meditate on the feelings of confidence. Bring the positive emotions from past successes into your present and approach your problem with those positive feelings instead. In order to strengthen your meditation skills to encourage greater confidence, it may help to picture future circumstances turning out in your favor. When you sit down to meditate, be very detailed in your visions. Use the confident feelings you know you have and place them into the situations you’re envisioning. Find a place where you can be alone with your thoughts. Sit in an upright position with good posture. Fight the urge to take a nap or go to bed. Take deep inhales and long exhales. Repeat a mantra or affirmation to yourself as you breathe in and out. Soon you’ll find that you won’t have to try as hard to reach your meditative state. Understanding and confidence will become part of your life and you’ll feel a greater power within. In theory it sounds like such an easy and delightful practice. The truth is that you’re likely to get bored at first and you’ll probably make excuses about whether or not you really have the time for it. Strive to remain disciplined and keep up with your practice. When you do, you’ll experience a true inner peace and confidence like never before. Want more Success Tips & Strategies to Live the Life You Richly Deserve? Join the Unstoppable Success Group Now! Are you suffering from low self-esteem? 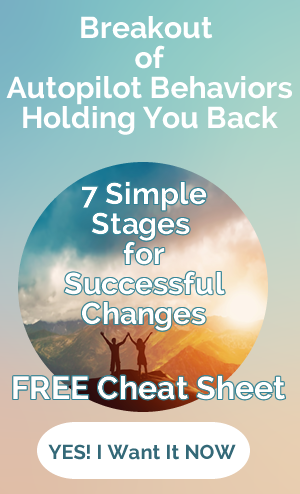 Do you feel powerless to change yourself into the confident person you deserve to be? If you answered "yes" to these questions, the good news is that strengthening your self-confidence is a task you really can accomplish with a little know-how and some easy strategies to show you the way. As you’ll soon find out, some of these strategies are even fun! Although your metamorphosis may not happen overnight, if you apply these strategies consistently, you’ll be able to build up your self confidence a little more each day. Make it a point to implement at least one confidence-boosting technique every day. Soon, these techniques will become habits, and your spirits will soar as your self confidence rises to new heights. Have realistic expectations. Even though it’s important to aim high in life, if your expectations are totally unrealistic, you’ll never know what it feels like to reach your goals. However, when you routinely succeed with realistic goals, it brings you great confidence. Tweak your expectations until you find a sweet spot where you’re still pushing yourself, but you’re also able to achieve. Once you know what it feels like to accomplish your goals, you’ll feel more confident that you can achieve whatever you set out to do. Surround yourself with positive people. They have a contagious, positive energy that lifts you up and encourages you, while negative people tend to bring you down and destroy your confidence. Build up your confidence by hanging around with positive people who make you feel good! Develop your skills and talents. Perhaps your self confidence suffers because you feel unsure about your abilities. Everyone, including you, has certain skills and talents that showcase the things they do well. Keep developing these talents and you’ll find that your self confidence will grow as you excel in these areas. Stick up for yourself. When others speak out against you, remember that those words are simply their opinion. Your opinion is just as important. When you do what you know is right for you, feel confident that you’ve made the right decision, regardless of how others may feel. Exercise or engage in physical games. Physical activities and exercise can calm you down and provide many benefits to your mind and body. When you engage in regular exercise, you feel more upbeat, which in turn makes you feel better about yourself as well. Reward yourself when you achieve. When you’ve accomplished something in your life, whether big or small, it’s important to pause and reward yourself. If you go out of your way to make yourself happy, you’ll feed your drive to persevere and succeed. Use positive affirmations. Positive affirmations are a great way to boost self confidence. They allow you to communicate with your subconscious mind, strengthening your confidence one thought at a time. Check out your local bookstore or online for some effective confidence building affirmations. Avoid dwelling on the past. If you keep your past self confidence issues in mind, it will be more difficult for you to get over them. Your past certainly doesn’t have to be your future. Focus on the present moment, with pleasant thoughts about your future. Picture everything going well. 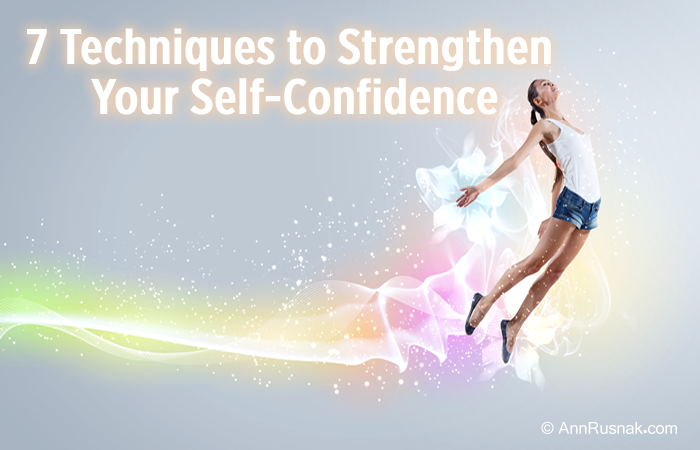 You’ll soon find that there are endless ways to boost your self confidence. And remember: If there’s something you want to pursue in life, go after it with all your heart and feel confident that success will be yours! What a strategy will you do today? Share it below! When you believe in yourself and you’re sure that you’ll succeed at something, you have self-confidence. Throughout life, your level of self-confidence might fluctuate when you’re faced with challenging situations. However, you have the power to build your self-confidence. Although parents can encourage young children to believe in themselves, as an adult, only you hold the keys to strengthening your own confidence. If you find that you’re feeling less self-assured than you’d like, you can step up and take action to shore yourself back up. Review the following strategies to find inspiration. Does she stand straight and strong? Is she relaxed and open to others? In addition to these traits, maybe she has a good sense of humor and looks people straight in the eye when she speaks to them. Or perhaps she models other characteristics you admire. Having someone to emulate is incredibly inspiring. Modeling after your mentor enhances your self-confidence. Identify what you’re doing right in your life. Sure, you know your shortcomings, but what about all those things you do well? Everyone excels at some tasks or activities. Seek out what those things are for you. Make a list of what you believe you’re good at. Consider this: no one in the world has the same unique qualities and strengths that you do in the way that you do. What are you doing right? If you know the answer to this, your self-confidence will bloom. Visualize you’re self-confident. You can most likely identify times and situations in your history when you didn’t feel particularly positive. Think about how you handled some of them. On your good days, you put your chin up and plowed forward into the situation at hand. You pretended you believed you could do it. And chances are, you did! Going forward, on the days you feel the least self-confident, think of your mentor and visualize youself possessing the same confidence. Believe in yourself. Have faith that you’ll make it through. Make a list of your strong points. What character traits do you have to offer that are of great benefit to you or others? Are you patient, kind or caring? Identify personality characteristics that you’re proud of. Ponder your strong points. Knowing yourself will enhance your self-confidence. In your daily life, notice when you do something well. Perhaps you just cleaned up your car and it looks awesome. Maybe you completed a report and it’s the best you’ve ever written. Recognize each day one small action where you excel. Perhaps you helped your child through a difficult time or you made a great chocolate cake. Give gratitude toward one thing during the day. Even if it’s as simple as getting up in the morning. Little efforts add up to build your self-confidence. Celebrate your progress. Take notice of your good fortune. When you’ve met or surpassed your goals, celebrate! Rejoice in your own successes. Congratulate yourself as you build the self-confidence you seek. Choose optimism as a daily approach to everything. Strive to be positive in life’s journey. When you make the decision to find the best in whatever life brings you, your self-confidence will soar. Strengthening your self-confidence is within your reach. Choosing a MEntor, knowing your strong points, and celebrating the attainment of your goals are just a few of strategies that build your self-confidence. Promise yourself today that you’ll strive to strengthen your belief in yourself. You have a legitimate right to live your life with great. Share below which technique will you use today to boost your self-confidence? When the very thought of certain activities evokes fear or anxiety within you, it’s because they’re outside your comfort zone. The idea of public speaking, for example, is outside most people’s comfort zone, even though it could be very lucrative! Your comfort zone is the sphere of activities that you feel comfortable with and that you can accomplish without negative emotions. It also includes people, places, and things that cause only positive thoughts within you. Is Your Comfort Zone Keeping You From Your Dreams? Your comfort zone can limit your capabilities and cause you to forsake your dreams and goals, or it can spur you on to great things. In fact, your comfort zone can determine both your personality and your potential for success. Many successful people achieve their goals because they have the ability to expand their comfort zone in order to get what they want. If you wish to expand your comfort zone, you can mentally condition yourself to be comfortable in new situations so you can overcome your anxiety, achieve your goals, and fulfill your dreams. Understand your mindset. Mental conditioning plays a large role in developing your comfort zone. This means that how we form our comfort zones begins in our own mind. Each of us already has preconceived notions of what may be comfortable and what may not be, and we designate mental guidelines to keep us within our comfort zone. You have chosen your own comfort zone boundaries! Knowing your boundaries is the first step to being able to expand them. Disobey some of your self imposed beliefs. If you want to expand your comfort zone, you must let yourself loose from the guidelines you impose on yourself. Breaking some of these beliefs will allow you to seek new experiences that can bring you greater success! Consider the true risk of a situation. It’s important to know what the true risks are, as opposed to what you feel (or fear)may occur. Knowing the difference can enable you to overcome your limitations. Challenge yourself to step outside your comfort level.Many times, we are our own worst enemy when it comes to boundaries and limitations. There are times when you’ll have to push yourself to get where you want to be. In these instances, you must meet the challenge to leave your comfort zone. When stepping outside your comfort zone brings you success, you’ll find that the benefits are well worth the effort! Whenever you try something for the first time, you’re bound to be a little uncomfortable. We’re all conditioned to fight change and stay in our comfort zones. You may have to remind yourself that only you can push yourself to step outside the box. Be patient, be aware of your self-imposed limitations, and try things in small steps at a time. This way your comfort zone will expand at a gradual, comfortable pace, and your fears and anxieties will subside as you gain positive experiences. Keep your dreams in sight! Expanding your comfort zone may be all it takes to achieve your goals and live the life you dream of. What are you afraid of? Are your worries preventing you from getting things accomplished in your life? Everyone has fears and many people let those fears stop them from doing things that may prove to be worthwhile or even lucrative. How can you turn your fear into a positive force in your life? The first thing you need to understand is the fear itself. Why are you afraid? Is it a rational fear? A fear of snakes can be rational, while a fear of spoons isn’t. Figure out if your fear is rational; if it isn’t, try to understand why you have such an irrational fear. You may need to seek help if you can’t understand or overcome it. Sometimes our fears can drive us to do great things and achieve massive success. Once you learn to conquer your fears, you can move past them. The strength you gain from conquering them can provide the momentum that drives you to future success. Sometimes the only way to get over a fear is to confront it head on. If you have a fear of failure about a certain task, then the only thing to do is take it on and beat it. If you succeed, you’ll be encouraged to face another fear. If you fail to conquer your fear the first time, regroup and try again. Each time you try, you’ll learn something new that you can use the next time around. Exercise. Physical activity boosts the immune system and strengthens the mind and body. 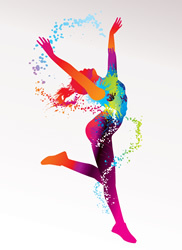 When you exercise, your body releases endorphins that help promote a healthy mind and body. In the least, exercise can take your mind off your worries. I find just doing 10 minutes of some type of physical activity really helps. Set goals. Take some time out of your day to set some specific, short term, and simple goals. The more you can complete, the more self-confidence you’ll build. Self-confidence is a powerful tool for removing fear. When fear begins to creep in, my thought turn to my bigger vision. I keep that mental picture in front of me. I remind myself that fear causes negative vibrations… bad mojo! Talk about it.Fears can multiply when you bottle them up inside you. When you let fear build, it snowballs and gets bigger and bigger until it becomes terrifying to you. Talking about it helps relieve the pressure and gives you the opportunity to obtain honest feedback. Put together a support team with people you trust. In my life, I have two very important and wise friends that guide me when fear and doubt invades. Things you can’t control. If you have no control over the outcome of a situation, why worry about it? You can’t change or control other people. What will happen, will happen. Worrying won’t make a difference at all in the situation. It will only add to your fears and prevent you from taking care of the things you can control. Things you can control. If you can control the situation you are concerned about, then it’s simple: take action! If you’re doing everything you can, then you no longer have any need to worry. 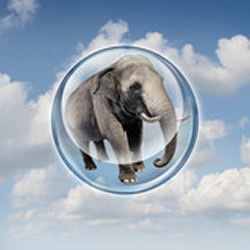 Worry slows you down, makes you second guess yourself, and could even lead to a self-fulfilling prophecy of failure. In the end, facing your fears head on will give you more self-confidence, provide valuable experience, and make you stronger. You don’t have to be a slave to your fears. You can face your fears valiantly and triumphantly! In life, the key to success is turning the challenges you face into opportunities to learn and grow. Isak Dinesen once said, "Difficult times have helped me to understand better than before, how infinitely rich and beautiful life is in every way, and that so many things that one goes worrying about are of no importance whatsoever." How do you discover your personality strengths and make them stronger? The secret to live a successful and happy life is to know yourself inside and out. The more you know about your weaknesses and strengths, the greater your potential to fly high and succeed. There are two ways to make the most of your potential. 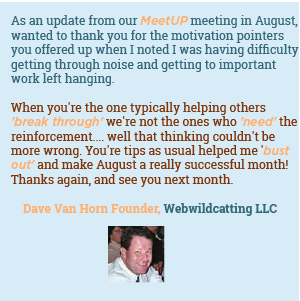 You can work on reducing your weaknesses and turn them into strengths. Alternatively, you can focus on your strengths and make them stronger. The most effective way to make the most of your gifts and talents is to magnify your strengths by making them even stronger. The first step toward making any change that lasts is to inventory your strengths and weaknesses. It’s essential that you know about yourself and take time to think about your aspirations, dreams, and values. Only then can you thrive instead of simply trying to survive. Keep a record of your life. Write a personal diary, compose poems about your feelings, or find other creative outlets, like drama, paintings, sports, or dance. Spend some time in front of a mirror. You can spend a lot of time in front of a mirror to express your feelings, or you can assess your inner thoughts. Looking at yourself in the mirror gives you a much better sense of who you are. When I first did this years ago, it really felt uncomfortable. Also look yourself in the eye and speak affirmation to support your uniqueness. A lot of actors and actresses do this to find out what they are good at and what they need to work on. Collect your thoughts. Give yourself time to recall what you did and why you did it. When you take the time to understand yourself by writing your thoughts down, you avoid just doing things without thinking. These discoveries and answers will give rise to new confidence. Also, you will be able to identify new talents you never knew you had. Ask for insight from your friends and family. They’re the ones who know you best, and you may be surprised to learn that they have a totally different perspective to offer. Pay attention to how you react. The best way to know your strengths is to observe the way you conduct yourself in stressful situations. Keep a journal and write in it each time you face a stressful situation. Describe the situation, how you responded, and what you could have done differently. This way, you’ll learn from your mistakes and fortify your strengths. Simply thinking about what makes you tick, what you’re good at, and what things you struggle with will create an awareness of yourself that will propel you forward in the direction of the life you deserve. Take some time today to rediscover who you are, and put yourself in a position to put your best foot forward.